Everything you need to Organize and Impress! I can’t believe how quickly this new school year is approaching. I remember the first day jitters, and nightmares that would quickly set in as each summer day came to an end. The majority of my anxieties seemed to stem from the fast approaching Meet the Teacher Night / Open House. From my experience I was able to try a couple different approaches: Give a presentation to everyone, Meet and Greet, and Stations. All of these methods have their pros and cons, given my experience I preferred stations. Another Reason I LOVE stations for an Open House is that they are extremely customizable. You can make a station fill whatever role you need it to. Below I will explain the 7 stations I used in my own classroom and how I organized the event. If you purchase the Open House / Meet the Teacher Bundle, you can duplicate and edit the slides to add as many as you need for your event. I set this up on a table that you can’t miss as you enter the classroom. Here parents/guardians sign-in. It then briefly explains the stations and encourages them to find and start with station number 1. This Station is typically set up at the front of the room, near the sign-in. Here parents snag the manilla folder with their student’s name on the tab (You can write their names ahead of time or they can when they get there.) Inside the folder is all of the permission slips, forms, and field trip notes that need their signature. I also glue a checklist to the folder, that way we both know if they were able to complete all of the requirements. **On the checklist, label the color of the form for a quick reference ie. Field Trip Form-Green, Computer Usage-Blue…etc) I also include instructions to set up accounts we will use in the classroom like Remind or Class Dojo. If there is one thing you take away with how I organize for Meet the Teacher, I hope it’s the folder tip. Parents take the folder around with them then once each station is completed it is turned into you at the last station. I’ll explain more with what I do with this folder at Station 7. 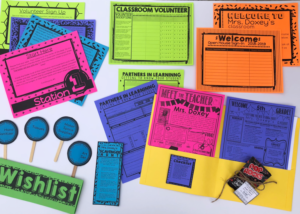 Parents and students are then directed to move into their desk, write the student’s names on all of their books, and make sure they have all of the items in their pencil pouch. This may be overdoing it, but when I have students move into their desks I ask that they put books, and notebooks on the left, with their whiteboard and pencil pouch on the right, starting with the largest items on the bottom. Setting this expectation from the beginning sets a tone for the rest of the year. **Unrelated, but completely related advice that I will give often: Expectations are everything, and you can’t hold someone to an expectation if they don’t know what it is. On the student’s desk besides the books and supplies I always place my Meet The Teacher and Classroom Information sheet. I print this beautiful infographic on a double sided single piece of paper. I love the flip-books so many teachers make, I just couldn’t justify the time >I had procrastinated away the entire summer> to take the time to make them. Thus the need for this beauty came. It’s simple, impactful, and parents/guardians leave with one page that contains all the information they will need for the school year. I also include a fun treat on the student’s desk to welcome them to their new home. At this station I ask parents to create accounts for the technology we will be using in the classroom. If you have an extra Chromebook, or iPad laying around this is a great place to utilize them. Most accounts can be completed through a smart phone so always encourage that so those without access don’t have to wait around. The two accounts I have parents sign up for is Remind and Class Dojo. However, I am always on the look out for a new or better option. I’ve come across two that may just fit that bill. Has anyone tried or heard of Bloomz or Class Tag? If you haven’t it might be worth checking out. If you have, I would LOVE to hear from you! 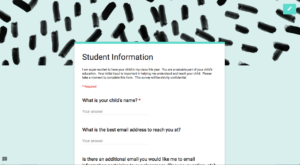 This station I make sure that parents/ guardians have taken the time to fill out, date, and sign permission slips for field trips, computer usage, photography release, social media usage…etc. I also include an example of the actual forms highlighting any areas that require initials or multiple signatures. I also ask that they make sure to check these items off of the checklist in the folder. Remember to color code the forms on the checklist this simplifies things for everyone! Finding the classroom library and picking out a book. Read the Meet the Teacher and Classroom Information sheet, try to find something in common with me. Each of these tasks ensure that whoever is filling out the student survey form has plenty of time. 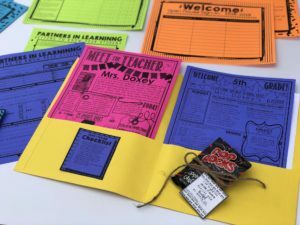 My Open House Meet the teacher Bundle includes two editable Parent Survey forms that you print and they fill out, then turn into you with the folder. I love these forms, and the little details included in them. 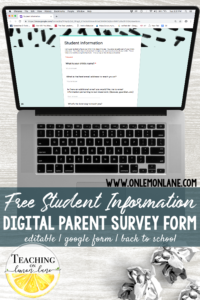 In my experience I have used both paper parent forms, and digital google forms. When given the choice between the two, I prefer the google form. The reason I prefer digital is largely due to data entry. Every response on the form is collected and entered into a google sheet. Instead of typing each email, and deciphering handwriting, a simply copy and paste gets the job done! If you would like to use the digital form I use for my Open House, simply CLICK HERE to become a member and gain exclusive access to freebies like this one! R: Room Volunteers are involved with all things classroom. They plan, facilitate, inform, and coordinate. P: Party Volunteer helps plan and prepare for class parties. L: Literacy Volunteer has a more consistent schedule. Work on reading concepts in small groups and individually. M: Math Volunteer also has a more consistent schedule. Works with students on a smaller scale need. ***Concept Support given to volunteers! W: Writing Volunteer: Can be accomplished at home rather than in the classroom. Read through student writing and provide feedback. D: Donation Volunteer. Support classroom through donating needed supplies or wish list items. O: Other, Do you possess a knowledge, talent, profession, connection…etc pertaining to our curriculum. We would LOVE to learn from you! 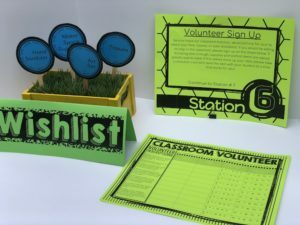 Also at this station I have my wishlist station set up with donation item “asks” they can take home with them and send back with their student. **If you have a need for your classroom, put it out there! You never know what you will get, and there is no harm in asking. 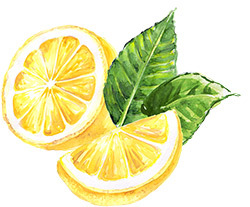 Suggestions besides the typical school supplies: Rated G Movies, Maker Space Supplies, Art Set, Board Game, Fun toys or treats for motivators, Thank You Cards, Art Supplies, Gift Cards: Explain what they will be spent on, Favorite Picture Book, Favorite Poetry book, Favorite Graphic Novel…ETC! Phew….. We’re almost there! Last station. This is where I stay for the majority of the evening. At this point you get to “briefly” meet everyone. You can ask the student if they found something they had in common with you while completing the scavenger hunt. ***Something to talk about….. Do not underestimate the need to have something to talk about when meeting someone for the first time. You can ask the parents if they have any questions, were they able to complete all of the forms… After introductions they hand you the beautiful folder full of important items you don’t have to send home with a student and pray for their safe return. **Quickly take the time to scan all of the forms checking on the dates, signatures…etc. If everything is in order, place it in a bin to be filed away later. One of the downsides to really any Open House or meet the teacher is that you will have parents concerned about their students and would like to use this time to discuss precious details that are better suited to be addressed in private, or they will want to talk your ear off while others wait to meet you. If this happens kindly point them to the conference sign up, and express how you would love to continue this conversation later and how excited you are to have their precious little one in your classroom. Be calculated in your delivery, do everything you can to make sure they feel listened to and cared for, but that you simply would like to continue it later. If you didn’t place the treat or welcome gift for the student on the desk, you can keep it back at this station to give to them when you meet them. The Open House Bundle includes a beautiful gift tag with a favorite quote on it: “I am so glad you are here. It helps me realize how beautiful my world is.” – Rainer Maria Rilke or you have the option of making your own editable pun worthy tag. Also included in the pack is a teacher information card the size of a business card. I’ve seen teachers laminate these and add a magnet to make a fun gift for the parents/guardians. Remember that beautiful manilla folder with all of the forms…etc in it. Once you have a lull in the traffic or are completely finished up. Take the time to create a google sheet or excel form and enter in your students roster, as well as each permission slip. From there mark each student who turned the form in. Then create a hanging folder for each type of permission slip. Next take the folder with the students name and file that in a place for all your students. Throughout the year, this is your place to keep student documents, notes about guided reading, reading records, writing pre-assessments and post-assessments, math assessments…etc. Come Parent Teacher conference, you will have an abundant supply of things to talk about and address. 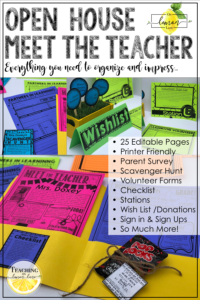 I hope this helps you better visualize and wrap your head around how to set up and organize your Open House / Meet the Teacher. I know the majority of the stress as a first year teacher was not having a clue what to do, or what an Open House even looked like. If you have any questions, need clarifications or would like something added to the bundle please let me know! 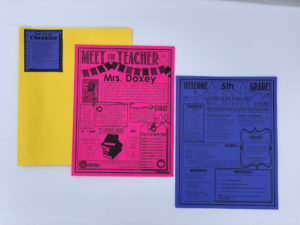 Remember the Meet The Teacher / Everything you Need to Know about the Classroom Form is not included in this bundle. You can purchase the two forms as a bundle or separately, but note they are editable in powerpoint, not google slides. As always I love to hear from you! What are your tips and tricks to a successful Open House / Meet the Teacher Night? Do you have any favorite apps or recommendations for Parent-Teacher Communication?